A flame grilled beef burger in a sesame seeded bun, with a processed cheese slice and a sachet of Rustlers sauce. A good cheeseburger is definitely one of life's simple pleasures. 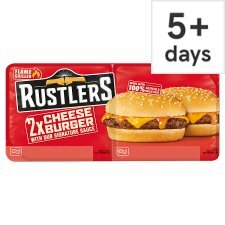 Flame grilled finest quality beef with melted cheese and a dollop of Rustlers sauce make for smiley, happy, satisfied people! Make it your own by adding your favourite toppings. Why not try some crunchy lettuce, sliced tomato or even a spicy addition! Keep in the fridge & don't freeze. Remove from packaging. Sick in the microwave and heat on full power. Add the cheese and the sauce, then enjoy!